Rebecca Black seems hell bent on proving to the world that she has what it takes to be a pop star. 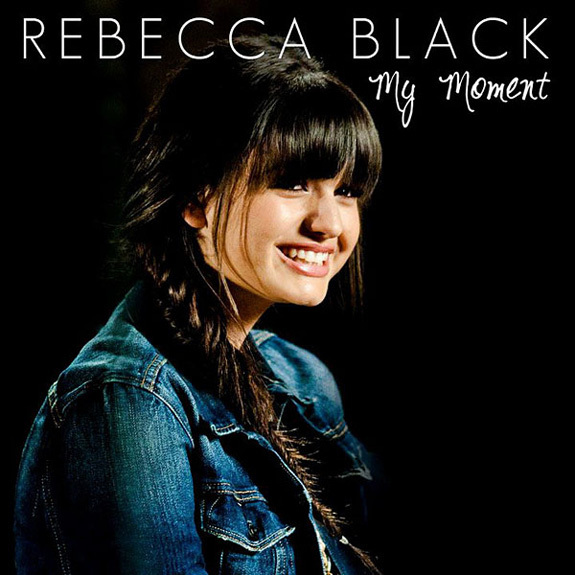 Case in point - Black's most recent single, "My Moment," a mid-tempo auto-tuned pop single and follow up to "Friday." After Black gained notoriety fame attention with her debut single, "Friday," I waited for it all to blow over. To me, Rebecca Black was the epitome of everything that is wrong with the music industry today. Apparently, ANY talentless hack can become a pop star as long as they fork over a few grand. I guess I wasn't surprised by this notion, considering I am an avid watcher of Bravo TV and have witnessed a 'Real Housewife' or two release a new single every season. There was just something manipulated and made up about Black's road to super stardom. Maybe it was the notion that her mother paid some company to turn her daughter into a pop star. Kind of reminds me of all of those poor souls who go into an American Idol audition under the false pretence that they actually have talent, only to be blind sided by the fact that the studio put them through only to make a public mockery of them on television. Unfortunately, Rebecca Black did not go away. Far from it! There were TV appearances, interviews, appearances at Awards shows, movie premieres, a cameo in a Katy Perry video....HELL. Black even won an award herself, the Teen Choice Best Web Star award to be exact. 15 minutes was clearly not enough for Black so it was only a matter of time before she dazzled us with a new single. Released in July, "My Moment" is a cheesy, schmaltzy pop song perfectly suited for children's movie soundtrack of some kind. Released on her own independent "label", RB Records, "My Moment" was written and produced by Brandon "Blue" Hamilton and Quinton Tolbert, and co-produced by Charlton Pettus. Vocally, the song does indicate that Black has at least a shred of talent, something "Friday" did not do. The problem is, there's seemingly very little of Black's actual voice in the recording. The vocals almost seem too too perfect. I have to praise Black for her persistence in not letting her dream die, but at the same time I hope this is it. In a world full of bad singers and past their prime celebrities, I don't really think we need Rebecca Black...at least not in this capacity. Perhaps she could be an actress. She seemed to hold her own pretty solidly in the Katy Perry video for "Last Friday Night (T.G.I.F.)." Just a suggestion. Check out the video for "My Moment" below. Quite disappointing when you compare it to it's ultra low budget predecessor, "Friday." At least the budget was increased for this video, but apparently with all of the money they spent on extras, choreography, dancers and the production itself, they had to cut out any semblance of a story. As asinine as it was, at least there was a general plot in the "Friday" video. "Friday" peaked at #58 on the Billboard Hot 100, faring slightly better in Ireland (#46), Australia (#40) and New Zealand (#33). Download "My Moment" on U.S. iTunes HERE and look out for an EP later this year.